Looks like I'm not the only young guy who's dumping the job world to run my otaku passion full time. At the amazing age of 12, Umar Brimah of Cape Girardeau, Missouri has opened a shop named Yumazu Anime and Collectibles. 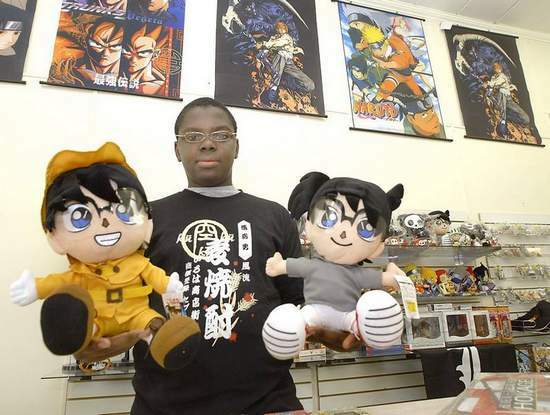 With help from his mother of all people, Umar is selling figures and other cool otaku stuff. I know this is a bit old news though since this was first blogged about in May on Zimbio, but this is simply awesome stuff. Kudos to the Brimah family and I hope as of this date things are going well. I guess some parents actually really do support our otaku passion, a topic that was recently brought up in a DC topic a few days back. Also, just to update those who are waiting for my exodus from my 9-7 drudgery, my goal date to quit my job is September 19th 2008. If I need a bit of an extra cushion of money and sales, I might extend my slavery... I mean job time till the end of October but most definitely before my 25th birthday at the beginning of November. I have much I want to accomplish like attending Japan and USA's video game and anime major conventions ('cause I missed a free pass to ComicCon ~_~). There is also my anime/flash video game in the works still simply dubbed, "Project Fumi" and the needed updates to my anime site (this one if you are reading from my blog directly). Anyways, hope this isn't getting too long but in the end what I'm saying is follow your dreams. Corny, but it works and you gotta work at it.